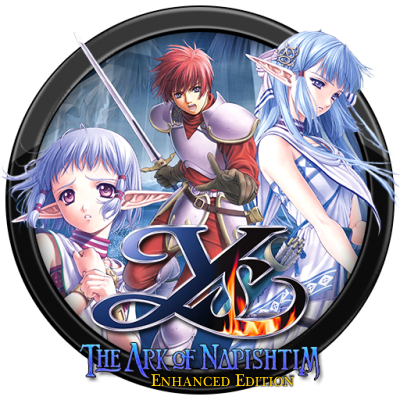 Extract the “Ys VI The Ark of Napishtim” folder to wherever you like and start the game with “ys6_win.exe” or “ys6_win_dx9.exe” (for ENBSeries). Use “config.exe” or “config_dx9.exe” to set your graphics, sound & input settings. Saves and settings are stored into “%gamedir%\user\%username%”. Updated English files “data_us.na”, “data_us.ni” and “data_us.nu” from “Update.3-ALI213” (2015-05-15) are included. The “release” folder should be compatible between versions. It’s from “CHS.Green.Edition-ALI213” (by 3DM) and might need a corresponding system locale. Edition, these files were from Steam and came with a crack. All other files were from GOG. – Large Access Aware Fix: “ys6_win.exe” & “ys6_win_dx9.exe” can now handle addresses larger than 2GB. music (in 224 Kbps). All tracks, except Ys6_26-29.ogg, because of some individual sound effects. Some are completely new and fully ripped/created. A MUCH smaller (from 2,35 GB to 977 MB), LOSSLESS cleaned, package. GOG and Steam version materials were equal. As exclusive lossless FLAC with CUE and Covers. There’s no need for any crack. Useless install and gog.com files.